I would just eat a lot of cheese and find a gas station every few days. Problem solved! OK<lets fix some birds,this is not a good subject,OK? 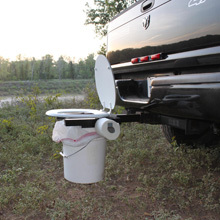 Could always go the "Bumper Dumper" route. Kinda like what we had downrange before the blue canoes showed up. As a bonus it will ensure others stay far away from your boondocking area. Take a look at Randy's last post. Has anyone reconfigured a shower in a older fc? Any pics? I am a average size modern man to quote I think Randy, standing at a petite 6’2” 280lbs. Marge’s little yellow shower has the best pressure I’ve ever seen in a rv, but the only reason I can shower in there is because I practiced yoga in order to avoid back surgery a few years back. Although, showering under the stars boondocking is great as long as there are no neighbors, I don’t want to scare anyone. I am handy and have been remodeling houses for a living most of my career, but I guess the Plumbing in Marge kind of intimidates me. Meaning not looking to remove and reconfigure black and grey tanks. I am not looking to save the world with our poop either, meaning I like the traditional black and grey tanks not looking to do composting.....has anyone done this? Or any ideas? Visit Keirn and Carolyn's homepage!